Our adventure in translating entrepreneurial tools for the arts domain continued today as I introduced my graduate seminar to the concept of an “empathy map.” Empathy mapping asks the entrepreneur to consider how potential customers think and feel, what they hear and see, what they fear, what they hope for, and so on. 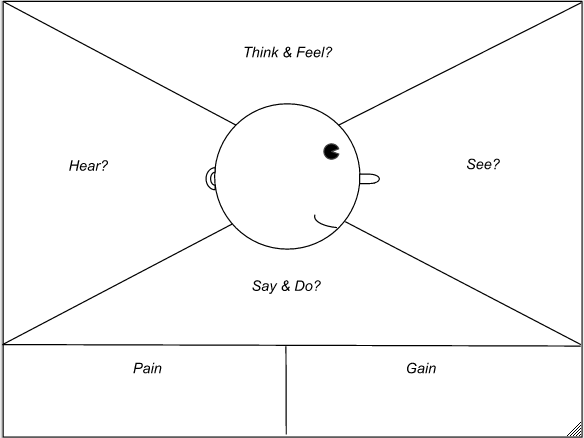 Although the empathy map is itself a kind of thought exercise, I asked the group to expand the thought exercise to consider what it would mean to use empathy mapping in a traditional performing arts production or presenting context. What might mean to sit down at the coffee house and get to know the people in the neighborhood before programming a concert series or trying to sell them a ticket? Rather than looking at demographic data about so-called millenials, what if an artistic director took three millenials to lunch and asked them about their fears and dreams? A focus group led by a marketing consultant isn’t good enough – empathy happens between people authentically, without a consultant mediating that relationship. There are of course people in the performing arts who engage deeply, directly, and empathetically (I think of Michael Rohd and his Sojourn Theatre or Rachel Grossman at dog & pony co, for example). It is not the norm – at least not yet – but we’re getting there, one entrepreneurial artist at a time. This entry was posted in Arts entrepreneurship, Arts management, Higher education and tagged audience development, audience engagement, customer development, Empathy map, Michael Rohd, Rachel Grossman. Bookmark the permalink.